Yesterday I finally went out and looked at vanity tops for the bathroom!! My mom and I went first to smaller boutique type bathroom store and they offered to get me a quote. But then we went to Lowes and Home Depot and I found a more off-the-shelf item I liked more! 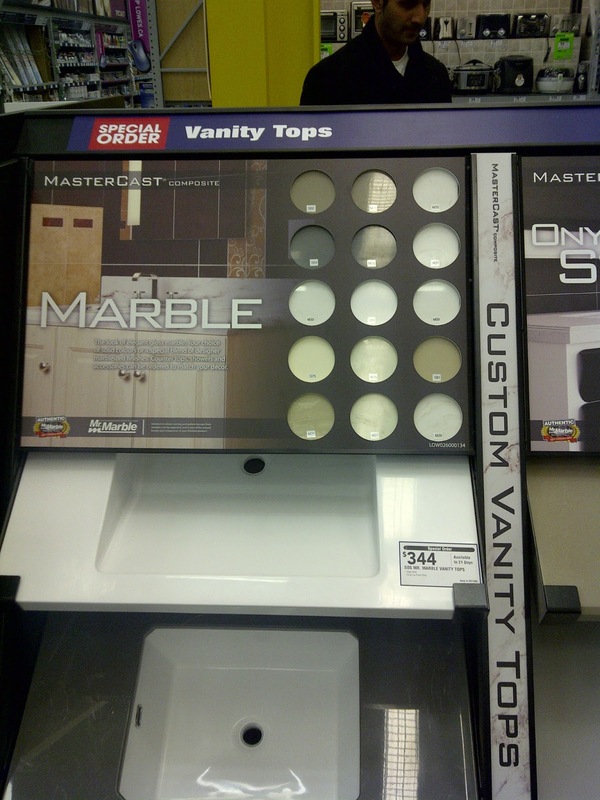 At both big box stores my mom and I were drawn to the countertops offered by Mr. Marble. They have a few different stones for various price points and multiple colours. 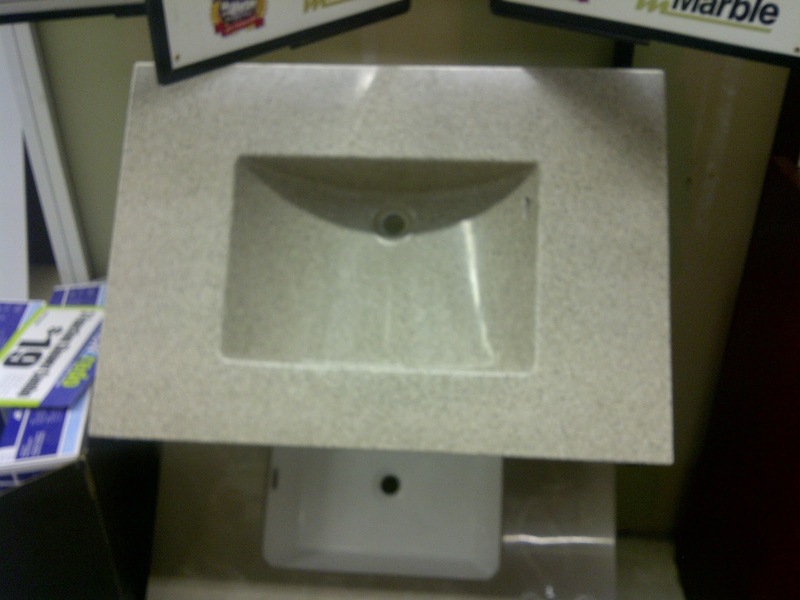 We loved that they were all-in-one sinks and thought that they looked mighty sleek with no seams. Oh, and did I mention they come in custom sizing?! My countertop needs to be 33 5/8ths across so I couldn't buy a standard top! The Lowes employee mentioned that there is a 1/4 allowance, so I may go a tiny bit smaller when I order and then caulk any gap that is left. If you want to see other integrated options, please see here on the Mr. Marble website. I am not sure which option I like the most yet (I think the sloped edge on the white one above is my favourite so far). All the different options are no additional cost! Go Mr. Marble! I originally was against waterfall (I feel it will never look clean due to water stains) but the other options were all kind of ugly in my humble opinion. 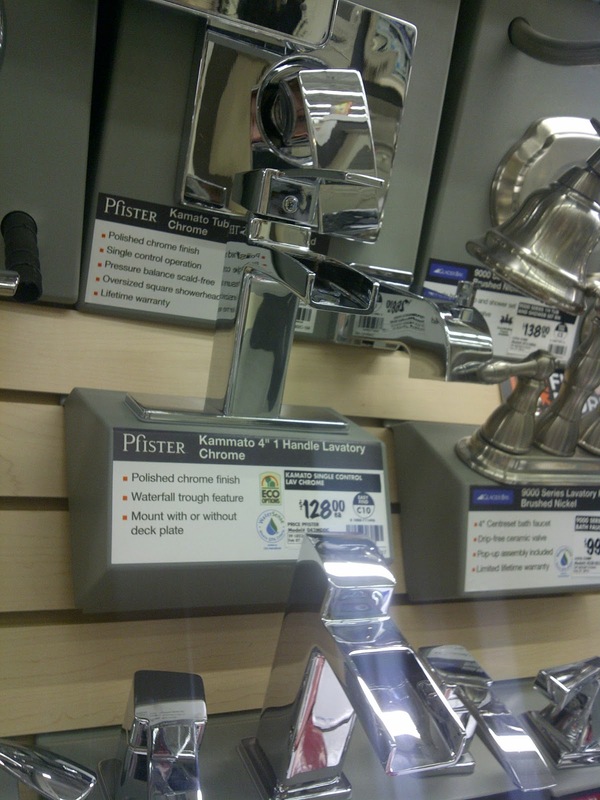 Plus there isn't a huge selection of bathroom faucets with a single tap vs. two and I prefer the single tap. It is 21 days to get in a custom top so I just need to make up my mind and order now! What do you think? 1. We both clearly love having our mom's around! I'm just in the middle of writing a post about tile shopping! 2. I love the white vanity with the slope edge as well and the waterfall tap. If you have the time/vehicle, I seriously suggest hitting up Bathworks. They're entire showroom is 15% off until Saturday. The sloped counter top looks great! DO it! The waterfall tap... no so much. I feel like it will be a passing fad and that in 5-10 years could look reminiscent of 70s lamp shades and shag carpeting... DON'T DO IT!